Marie Catrib made so much more for our community than good food. Through her cooking, Marie Catrib cared for a lot of people. I’d risk a guess that the overwhelming majority of people in this city have been welcomed into Marie’s and well-fed. So many people have shared sadly smiling memories of great meals and warm interactions at her restaurant since her passing this week, and it’s quite clear how much she was loved by the community. It’s important to realize, though, that Marie Catrib actually helped shift the entire food and business climates of Grand Rapids. She raised awareness about good food. She instilled courage in small entrepreneurs who saw her as an example of sticking to your philosophy, doing work you’re proud of and conducting your business in a way that infuses positive energy in your environment. 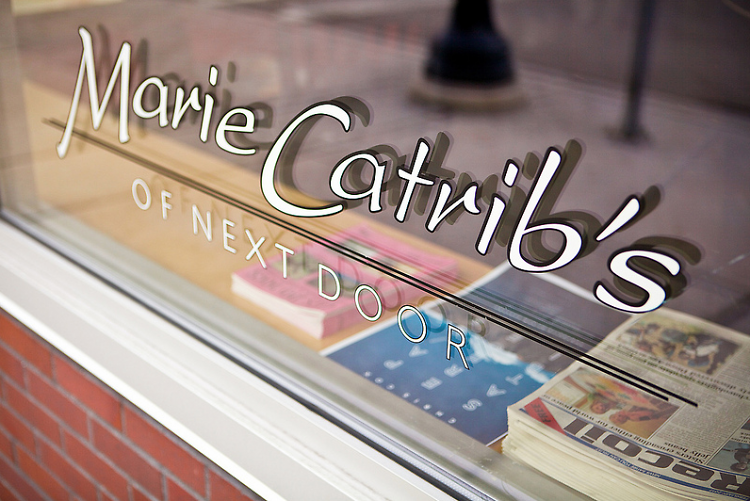 Marie Catrib’s restaurant became a social hub of Grand Rapids but even more importantly, she lead a shining example for the food community. Marie’s was a forerunner in the farm-to-table movement, and showed a great many other restaurants that, yes, farm-to-table cooking can be successful, sustainable and efficient as a business practice. By being one of the first restaurants to offer fresh, homemade, farm-to-table cuisine, she showed other restaurateurs that we, as a city, want this. People respect good food, good business and good work, and will support entrepreneurship accordingly. Many restaurants and local chefs credit their inspiration for their artisanal and farm-to-table menu elements in part to seeing her success and commitment to those philosophies and how receptively the community responded to her work. This shift has even changed our food economy as a whole: farmers markets, CSA’s and local sources for food have all found great business success as we Rapidians agree that wholesome local ingredients are what we’d all prefer. Simply enough, this whole shift in our food culture can be traced back to a great extent to one extraordinarily kind woman, up before dawn, in a kitchen filled with the smells of baking baklava. We all hold tightly to memories of food. I’ve spoken with many local chefs since Marie Catrib's passing, and not one of them failed to mention something that she made for them or showed them how to make or a favorite meal at her restaurant. Marie Catrib has fed a whole city of bellies, and the passion she kindled with her work will continue on to inspire many more to uphold those philosophies of doing good work and taking care of people- from the new businesses that will open with the intention of maintaining and supporting a healthy community to the mother, attempting to recreate a sweet she’d eaten once at Marie’s for her children. This evening, I’m going to bake a cake in honor of those who’ve baked for me in the past: to celebrate, to nourish, to reward and yes, to make me feel good. Marie Catrib was definitely one of those people for me, as she was for so many others. When I share what I’ve made with my friends and family, I can only hope that they too recognize the spirit that was shared by Marie and all of us who make things out of love, passion, pride and care. Marie Catrib cooked a legacy for our city. She made a great deal more than just food for us, and we should all feel very well-cared for.